Play Pokemon Go Without Moving using Fake Location/Fake Gps: Pokemon Go is a free-to-play location-based augmented reality mobile game developed by Niantic. It was released in July 2016 for iOS and Android devices. Everyone is enjoying the gameplay of pokemon go game. The game is location based, You need to catch Pokémon in real life through augmented reality, using the GPS And Location installed on to Android and iOS systems. If you want to know complete description and gameplay of this awesome game visit Official Pokemon Go gameplay of Pokemon Go or See Gameplay of Pokemon Go 0n Wikipedia. The game allows players to capture, battle, and train virtual creatures, called Pokémon, who appear on device screens as though in the real world. It makes use of GPS and the camera of compatible devices. Soon after the launch on Pokémon Go was released to mixed reviews. Got appraisals as best adventure real-world game, However, there are also technical issues the most common issues are server issues and GPS location issues. As pokemon go is completely real world augmented game ie you need to move your self and device in order to move the character or player in the game. The game was released only in some countries like Australia, New Zealand, and the United States only. As I said before pokemon go is location-based augmented game so you need to move along the locations to move your character in the game. However it is not possible all the time, Can’t we enjoy or Play Pokemon Go without moving ????? You can enjoy playing Pokemon Go Anywhere using Fake Location/Fake GPS/Location Spoofing. Now start following me to Play Pokemon Go Without Moving using Fake Location/Fake GPS with the help of our guide. If you are playing the game for the first time you might face like Failed to Detect Location of Pokemon Go, GPS signal not Found or Player or Character not moving in Pokemon Go. We have an individual guide discussing each and every issue with pokemon go game hit on the link provided. Present here we are discussing How to Play Pokemon Go Without Moving or with a Fake Location/Fake GPS. Following devices iPhone 6s, iPhone 6s Plus, iPhone 6, iPhone 6 Plus, iPhone 5, iPhone 5C, iPhone 5, iPhone SE, iPhone 7, iPhone 7 Plus, iPad 2, iPad 3, iPad Air, Air 3, iPad Mini, iPod Touch and devices running iOS 10, iOS 9, 9.1, 9.2, iOS 9.2.1, iOS 9.3, iOS 9.3.1, iOS 9.3.2, iOS 9.3.3, iOS 9.4 can utilize this tutorial. Using the search option, type in PokemonGoAnywhere and install it, That’s all you have to do. This tweak starts working. Following android smartphones Micromax, Lenovo, Samsung, Asus, Xiamio, HTC, Sony, LG, One Plus running with operating systems KitKat, Lollipop Marsh Mallow, Nougat can follow these steps to Play Pokemon Go without moving or With Fake Location/Fake GPS, Location/GPS Spoofing and Go Any Where Without Moving or Walking. Download and install Fake GPS Android App. Next step is to Install Fake GPS Location Spoofer as a system app. This can be possible by using Lucky Patcher. Install Lucky Patcher from Here http://lucky-patcher.en.uptodown.com/android. [Copy and paste the link on browser]. Grant root permission to Lucky Patcher when it asks. Now search for Fake GPS in Lucky Patcher App. You can get Fake GPS in Lucky Patcher and now install this as a System app. To do so navigate to Tool–>>Move to System App—>>Tap on Yes. That’s all now restart your android mobile. Once the app is installed, you will need to enable “Developer options” on your phone. To do so go to About Phone >>> Build Number. Hit on build number 4-7 times this will enable “Developer options” (found in Settings). Now go to “Mock location” then choose the Fake Location Spoofer that you just installed. Now use this fake GPS an enable expert mode and search for whatever the places you want and pin the location. Next step is to open the Fake Location Spoofer app. A map indicating places will be displayed. Choose a location, simply pinch and zoom on the map and double-tap on it. Now hit the orange play button on the bottom. Fake GPS app will put notification of spoofing your location. On opening Pokémon GO, inside the game, you will be presented with a map of the location you are spoofing, Start playing pokemon go without moving or by using fake GPS/fake location or by location spoofing. 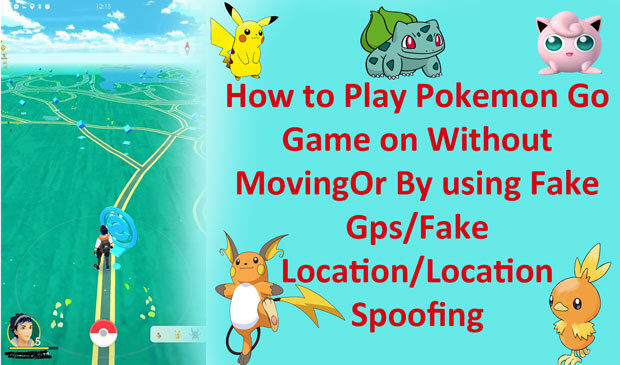 That’s all about How to Play Pokemon Go without Moving using Fake Location/Fake GPS and Go Anywhere/Location/GPS Spoofing on Android/iOS devices. If you have any queries or any other solutions rather than this we welcome to share without database. Thank you.